Traditionally, wearing shirts was reserved for men, while women wore blouses. For a few years, many brands such as ChemiseWeb.com have designed women shirts. We would like to go back to the differences between these two products. Woman shirt or blouse, a matter of taste. The collar and cuffs of the blouse are not, in contrast to those of the woman's shirt, rigid. The blouse will therefore be more fluid than the woman's shirt and will not offer as much outfit. Indeed, the woman's shirt is constructed as a man's shirt. It has a collar with stiff whales and reinforced cuffs for an impeccable fit. More modern than the blouse, the woman's shirt seduces more and more working girl. 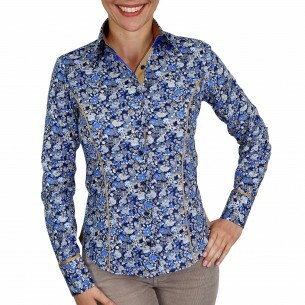 For several years we have been designing seasonal collections of shirts for women. It is not about blouses, but about shirts designed, drawn and cut for women. Several hundred models are constantly available on our site. Produced in small quantities and never renewed, our women's shirts offer you the assurance of an exclusive elegance. It is somehow Dr. Jekyll and Mr. Hyde of fashion, a semi-demon half-demon brand, which subtly combines extravagance and British sobriety. From this alliance comes products perfectly balanced "fashions". As for quality, it is in all respects similar to English standards: exemplary! Andrew Mac Allister's manufacturing demand for high-quality materials, cuts and shaping is reflected in the packaging. Because an exceptional product must be packaged in an exceptional packaging, we take great care in presenting our products. Cellophane with fancy print, etc.